Angry over the police denying entry into the Vice-Chancellor’s office, a group of protesting students damaged the property on the Panjab University campus and roughed up a senior police officer today. The protest against hike in mess charges turned ugly when students were stopped from entering the VC’s office. They tried to break the fence and the police had to use force to prevent them from taking law in their hands. Despite the VC coming up with a solution, the students refused to call off their protest and a group of students staged a protest outside the VC’s office. A large posse of police along with water cannons was stationed outside the VC’s office to control the agitating students. The protesters alleged that the policemen also slapped girl students. The agitating students charged towards the VC’s office and damaged the university property. The situation went out of control when DSP (Central) Ashish Kapoor was allegedly roughed by students. While the DSP was trying to pacify the protesters, some students pulled the DSP and he fell on the ground. Seeing the situation getting out of control, the police apprehended some students, including girls. However, they were let off after the students protested against it. To avoid any untoward incident, five SHOs from different police stations reached the campus. The UT Estate Officer, Rahul Gupta, also reached the campus and spent his entire day outside the VC’s office. In the evening, VC Arun Grover floated the idea of having food kiosks near every hostel where limited food would be served at Rs 24 per person, but the agitated students refused to call off the protest. A CBI court today dismissed the bail plea of Deshraj Singh, SP (City) under suspension, and stated that the release of the senior police official at the initial stage of the CBI’s case might hamper the investigations. Deshraj is lodged in barrack number 10 of Burail Jail since October 20. He has been suspended after registration of a case against him. While dismissing the bail application, the court stated that the accused was a senior police official and his release from custody at the initial stage was not desirable considering that the complainant in the case was also a police officer. “The complainant in the case is the SHO of the Sector 26 police station and thus it is not desirable to grant bail to the accused at this stage,” said the court. Heated arguments were witnessed in court when defence counsel Vishal Garg argued that there was no reference to the alleged demand of bribe in the transcript of recorded conversation between Deshraj and the complainant and the case is a frame-up. The defence counsel also argued that Deshraj’s daughter was to be operated upon in Mumbai on December 3 and thus he was required to attend her. The defence also argued that there was no shadow witness in the case. The CBI opposed the defence plea and said Deshraj had a large family. He has seven siblings and his wife is well educated to deal with any such requirement with regard to hospitalisation of his daughter. The CBI prosecutor also told that court that in the transcript on the day of trap Deshraj was heard telling complainant inspector Anokh Singh to hand him the bribe amount. Deshraj Singh was arrested on October 18 while taking a bribe of Rs 1 lakh from inspector Anokh Singh for giving a clean chit to two departmental inquiries marked against him. Deshraj was arrested from his Sector 23 residence where he had allegedly called the inspector to hand him the amount. The authorities have begun the exercise to impose property tax in Mohali district, with the Punjab Municipal Corporation (2nd amendment) Ordinance, 2012, coming into force from November 5. Mohali is the only district in the state which is yet to impose property tax. Talking to The Tribune, newly appointed Mohali Municipal Corporation Commissioner AK Sinha, who is also the Chief Administrator of the Greater Mohali Area Development Authority (GMADA), said the exercise to calculate and impose property tax would be complete in a couple of months. The district would be divided into five to eight zones and the tax structure would be different in each zone. Notably, the zone determination would be done by a zoning committee, headed by the Director, Local Government, Punjab. The member secretary of the committee would be the MC Commissioner. The unit value for the imposition of tax on building and land would be determined by the unit valuation committee. The basic unit value would be determined after considering the prevalent price of land, cost of construction and the rental value in the area. As Mohali is a planned town, there will not be much variation in the basic unit rates per square metre in the different zones. However, public objections would be called in both cases, including determination of zones and basic unit value. The ordinance stated that the tax would be 5 per cent of the total unit value in case of residential building, 20 per cent of total unit value in the case of malls and five star hotels and 15 per cent of the total unit value for others. Mohali Deputy Commissioner Varun Roojam said the district administration has also begun its exercise. When asked how much revenue would be earned after the imposition of property tax, Roojam said as per rough estimate, it would be over Rs 50 crore per annum. “The money collected from property tax would be spent on development works,” said A K Sinha. Claims of her family members that schoolteacher Monica Goyal was murdered by her in-laws on October 15 have been substantiated with the police slapping charges of murder in the case today. Almost 20 days after the mysterious death of Monica Goyal at her Sector 21 residence in Chandigarh, the police has booked her husband and in-laws in a case under Section 302 of the IPC. DSP Vijay Kumar said they have slapped sections of murder in the abetment to suicide case following the CFSL report. “Four accused in the case are already lodged in Burail Jail and we have registered a case of murder against all four of them following the CFSL report. The investigations are on and more reports are awaited,” he said. A team of the CFSL had reconstructed the death scene a fortnight ago and hung a dummy from the ceiling fan. “The forensic team established that Monica was beaten up the night before her death and then her body was hanged from a ceiling fan. The CFSL had also not ruled out the possibility that Monica could have been hung in an unconscious state,” said a police official. Monica’s husband Vikas Goyal, father-in-law GP Goyal, mother-in-law Prem Lata Goyal and brother-in-law Vishal Goyal are already in judicial custody since the police arrested them in an abetment to suicide case after Monica’s parents alleged that she was physically tortured. The police had also added section of destruction of evidence after they recovered a bed sheet from her residence which had been washed by her in-laws. Moreover, following a theft incident at Monica’s residence last week, the police had recovered blood-stained undergarments of the victim from the washing machine and the blood matched with that of the victim as per the CFSL report. The post-mortem report of the woman had stated ‘asphyxia due to hanging’ as the cause of death. However, following allegations and rounds of protests by Monica’s parents, who alleged that it was murder, the police got the scene reconstructed by the CFSL. A BCom first year student of MCM DAV College in Sector 36 was injured after she fell from the second floor of the college building today. Parul Malhotra (19) is admitted to the PGI and her condition is stated to be critical. Prima facie, it appears to be an accident, but the police is exploring all angles. High drama was witnessed at the college when Parul fell on the ground floor. The college authorities rushed her to Government Multi-Specialty Hospital in Sector 16 from where she was referred to the PGI. Parul suffered fractures on her left leg and right arm and also lost her two teeth in the incident. The incident took place at around 1 pm during the Commerce Fest organised by BCom students. Parul and her two friends left the fest and went to the second floor of the triple-storeyed building. Parul fell from the second floor and there was no eyewitness to the incident. The police said Parul was not fit for recording her statement. Parul’s friends told the police that they last saw her sitting at the window and the next moment, they heard a noise and noticed that she had fallen. The police has registered a DDR at the Sector 36 police station. Buying crackers will burn a hole in your pocket this Divali as the prices have witnessed an increase of 10-15 per cent this year. The prices might go up to 20-25 per cent in the retail market, said wholesale dealers in the tricity. “The prices of crackers and shooters brought from Shivakashi have seen an increase of 15 per cent," said Panchkula-based dealer Ramesh Bansal while adding that shooters were comparatively more expensive. "Hike in the charges of labour and raw material are some of the reasons cited behind the rising prices," he said. A Mohali-based fire cracker supplier, Summit Bedi, said a variety of branded fireworks were available and shooters had seen a rise of 18-20 per cent. One of Kurali-based firecracker suppliers Balwinder Sood said the increase in VAT and excise on fireworks, too, had led to the hike. VAT on crackers has gone up from 12 per cent to 14.3 per cent while excise duty has increased from 10 per cent to 12.5 per cent. "The prices of chemicals, too, have increased," he said. He, however, said the sales are expected to pick up in a day or two. Meanwhile, the market is flooded with colourful pots, musical shoots and other whistling items. “Many manufactures from Shivakashi have used Chinese formula, especially for making shooters, this year," said Ramesh Bansal. Don't be taken aback on seeing "Made in China" written on the idols of Hindu deities. More than 50-60 per cent of idols being sold at gift stores in Chandigarh have been brought from China's mass production factories. Chinese idols of Goddess Saraswati, Lord Ganesha and Goddess Lakshmi, made of polystone, gold-foiled wall pictures and statues are widely available at various gift stores. Owner of a gift store at Sector 11 said markets were flooded with the idols. He said in the past, Chinese incursion was limited to crockery and lights, but now the country has dominated the gift market in India. Apart from idols, gold-foiled cards, poker sets, Chinese aromatic candles, designer diyas, porcelains, flower pots and other range of products are attracting buyers. Electrical diyas are also finding place in the living rooms. Owner of a gift shop said Chinese goods had become an integral part of Indian festivals. "This year, we have brass and crystal candles, besides a wide range of other products," he added. The most sought-after items are fancy crockeries, lights and other decorative items. "The country is yet to enter into the cards business as Indian printing is far better," he stated. Wine-related products are also catching the fancy of residents. As far as corporate gifts are concerned, crockery, laptop accessories, wine glasses are getting a lot of attention. Owner of a gift shop in Panchkula said this year people were buying dinner sets and bed sheets as compared to chocolates and other fancy items. The district administration has prohibited the sale of crackers in parking lots of markets keeping in mind the safety of residents and parking problems. 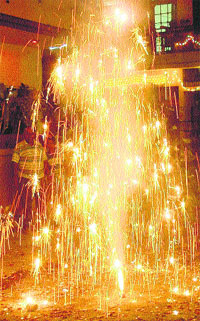 Deputy Commissioner Varun Roojam today reduced the number of sites in the town for the sale of crackers. Now, only four sites have been earmarked for the purpose. These are Dasehra Ground in Phase I, the ground near Bassi theatre in Phase II, Apni Mandi ground in Phase VIII and a park in Phase XI. In rural areas of Mohali sub-division, the sale has so far been permitted only in Sohana and Banur villages. As per reports, the ban on the sale and use of high-intensity crackers continues. A ban has also been imposed on the use of a Chinese toy pistol that emits flames. Though Divali is nearing, the sales are yet to pick up. Shopkeepers lamented that the sales had witnessed a dip by 20-30 per cent. Rajiv Goyal, who owns a shop at Sector 18, said only a few customers were coming to buy crockery. “The recent hike in prices followed by liquidity crunch in the market has played a spoilsport," he said while adding that the sales had plummeted by 25 per cent. Gagandeep Singh Luthara, city-based wholesale diamond supplier, said he had cut down on his Divali budget. "Inflation has affected our business. Not many buyers turned up this festive season," he said. Anup Sachdeva, Chandigarh-based businessman, said that he had given gifts to 200 clients last year, but the number had gone down this year. Manan Sharma, who runs a salon, said, “The service and entertainment industry is doing good as compared to other sectors, but inflation has hit the market hard." Gift prices, too, have seen a hike of 20-25 per cent, especially in imported items. “The transportation cost has gone up. These factors have resulted in a hike in the prices of gifts by 20 per cent, said Diwakar Sahoonja, owner of a gift shop in Chandigarh. Panjab University has decided to approach the Union ministers urging them to help in getting subsidised cylinders for the university. The university is going to write to five union ministers, including Railway Minister Pawan Kumar Bansal and those nominated in the Senate, seeking one cylinder on subsidised rates against each hostel resident every year. There are around 6,700 hostel residents at PU. PU Dean, Student Welfare (DSW), AS Ahluwalia said the university would be approaching Pawan Kumar Bansal, Manish Tewari, Ashwani Kumar, Preneet Kaur and Selja Kumari. "We will urge the government to provide one cylinder per student on subsidised rates in a year, which will help in controlling the mess charges," the DSW said. PU officials said the mess charges would be reviewed by a joint consultative committee. Over 100 staff members at Government Multi-Speciality Hospital (GMSH), Sector 16, held a candle march, which started from the hospital and ended at the Sector 17 Plaza this evening. They were demonstrating against the delay in the acceptance of their demands. A day after Canadian Prime Minister Stephan Harper’s visit to Deluxe Dhaba in Sector 28 today, majority of visitors to the dhaba was inquiring about what the PM liked the most from the dhaba’s menu. They were seen enquiring from the staff present there. The visitors were more curious to know about ‘Tilla Kulfi’. Meanwhile, at the Pal Dhaba, where the Canadian Prime Minister’s visit was cancelled, people were curious to know the reason as to why his visit to the dhaba was cancelled. Bharat Trehan, team head, Deluxe Dhaba, said that after the PM and his delegation savoured the ‘Tilla Kulfi’ yesterday, the visitors were enquiring about the sweet dish today. Some of them also ordered for it. They had even received phone calls from their relatives and friends congratulating them, he added. Jasbir Singh, cashier, Deluxe Dhaba, said that he was busy answering phone calls since morning. “Though the people have read about the PM’s visit to our dhaba in newspapers, they were still enquiring about the same from the staff, he added. Meanwhile, at the Pal Dhaba, when Pritpal Singh, Dhaba owner, was asked about the reasons behind the cancellation of the PM’s visit, he said that it was the Canadian Consulate that took the final decision. Income tax officials raided Aditya Crockery at Sector 10 here today. Sources said, a team led by income tax assistant commissioner Abhishek Narang entered the shop at around 10 am and checked the account registers and records. To expose anti-pensioner policies of the Punjab Government, pensioners of the state have planned a protest dharna under the Joint Front of Punjab Government Pensioners outside the Deputy Commissioner’s office in Mohali at 10.30 am tomorrow. Mohan Singh, general secretary of the Punjab Government Pensioners Association, appealed to the pensioners of Mohali and the nearby areas to participate in the protest. The copies of all orders issued by the Punjab Government against the pensioners of the state would be burnt during the protest. Violations of building by-laws at Pal Dhaba led to the cancellation of Canadian Prime Minister Stephan Harper’s visit to the dhaba. Harper’s visit to the dhaba, which was scheduled for November 7, was cancelled by the Canadian Prime Minister’s office and Canadian Consulate. It was later rescheduled and the PM along with his delegation dined at Deluxe Dhaba in the same Sector 28 yesterday. A senior official of the UT Administration said that they had conveyed to the Canadian authorities that the Estate Office had issued notice to Pal Dhaba for violation of building bylaws and the Administration suggested that an unwarranted controversy could emerge by visiting the popular eatery. But the official further added that they had just conveyed their message to the authorities but why the visit was cancelled, only the Canadian authorities could give the right answer. Officials of the Canadian Prime Minister’s office were not ready to divulge the details. When contacted, Pritpal Singh, owner of Pal Dhaba, said that they had constructed a small shed to wash the utensils on the roof but after receiving the notice, they had removed the same. They had complied with the notice and had submitted the photographs to the Estate Office, he added. He further added that he was not aware as to why the PM’s visit to their dhaba was cancelled still he was happy that the Canadian government had considered their dhaba for the PM’s visit. After failing to recover mess and canteen dues of more than Rs 1 lakh from a leader of the Panjab University Students Union (PUSU), the university has now approached the Chandigarh Police seeking its interference for recovering the dues. The university is preparing a list of such defaulters against whom stern action will be initiated. The controversy surrounding PUSU leader Sukhjeet Singh Brar had hit the headlines when the opposition party highlighted the pending mess and canteen bills of the leaders during his stay at the boys hostel number 5. PU officials in a letter to the SSP stated that Sukhjeet, who had mentioned himself to be a resident of Bathinda district, was a hostel resident at PU during 2011-12. "Sukhjeet left the hostel without paying the mess and canteen bills," the officials stated. PU officials in their letter to the SSP on October 30 stated that PUSU leader had left the hostel without informing the authorities and he was warned several times through notices, but he did not pay heed to it. The university has requested the police to take necessary action to recover the hostel dues. Interestingly, Sukhjeet Brar was also spotted outside the Vice-Chancellor's office today, where the students were demanding a rollback in the mess charges. "At the time of the student elections, the PUSU leader had claimed that he didn't get time to clear his dues as he was implicated in a false case, however, even two months after the elections were held, he is yet to pay the amount," the PU officials said. The university is now planning to frame a policy under which stern action will be taken against the students who fail to clear their mess and canteen dues. CHANDIGARH: Ankita Sharma brought laurels to Saupin’s School, Panchkula, winning the Bioscope 2012 Hypertext Story Board Challenge organised by Baddi University, Solan. As many as 1,000 schools participated in the competition,out of which 50 belonged to the tricity. Ankita Sharma wrote on the theme ‘Ships’. Her innovative ideas helped her in winning the competition. Principa, Jayeta congratulated her on her success. The CL Aggarwal D.A.V Model School, Sector 7-B, Chandigarh, organised an anti-crackers rally, in which more than 100 students took oath not to burn crackers on Divali. The rally was flagged off by school principal Sunita Ranyal. She told the students about the side effects of burning crackers. Students of Government Model High School, Sector 38-D, Chandigarh, pledged to stay away from crackers and organized an anti-crackers’ rally. Flagging of the rally, Surinder Kumar, headmaster of the school, said, “The objective behind the anti-crackers rally is to create awareness among masses to celebrate Divali without crackers, because crackers cause pollution and it also leads to accidents. Students must opt for celebrating safe Diwali, he said. An anti-crackers rally was organised by the students of Government Model High School, Sector-28C, Chandigarh. Around 300 students participated in the rally. With the help of slogans and banners the message was conveyed to the residents, to celebrate a cracker-free Divali and join hands to reduce pollution. Ram Parkash Sharma, in charge of the school, appreciated the efforts of the students and teachers. An Anti-Crackers Rally was organised in Sector-21 by around 100 N.S.S volunteers of. G.M.S.S. School, Sector 21/A, Chandigarh. It was flagged off by Jasbir Kaur, the principal of the school. It was with the view to create awareness about the ill-effects of fire crackers causing noise and air pollution among the general public. An anti-cracker rally was taken out by the students of Shivalik Public School, 41-B, Chandigarh, in the Sector 41 area. Students of classes VII and VIII made placards and slogans to make the local masses aware about the ill-effects of burning crackers on our environment. They motivated the people by spreading the message to have “Safe and Green Divali”. Efforts of the students were appreciated by the principal. Mohali: The annual day function ‘ UMANG 2012’ of Shishu Niketan Public School, Sector - 66, Mohali, was celebrated with enthusiasm on the school premises. The programme began with the worship of Goddess Saraswati. This was followed by several theme based performances. In the end, prizes for excellence in academics, sports and co-curricular activities were given to the students.